Want to experience the small space life? 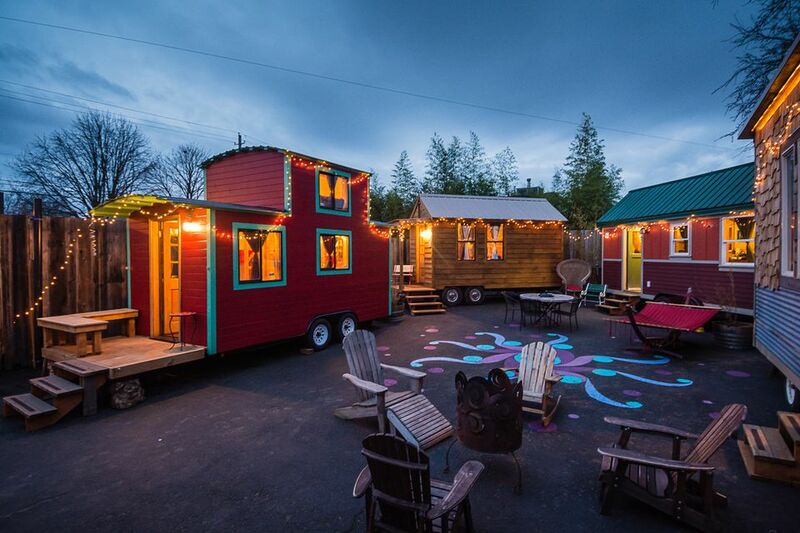 Take a tiny home vacation at Caravan, America’s first tiny house hotel located in Portland, Oregon. This unique lodging establishment has five little guesthouses that range in size from 100 — 200 square feet. Each abode features creature comforts including a fully functioning bathroom and kitchenette. Room service is also available via a local restaurant. If you need additional elbow room, there's the hotel's courtyard where guests are encouraged to sit in Adirondack chairs or to relax in a hammock. There's also a community fire pit where customers can make s’mores using complimentary ingredients. And since Caravan is located in Portland’s bustling Alberta Arts District, entertainment, shopping and dining options are within walking distance. We have more photos so keep reading! Did you know that back in the day railroad cabooses provided shelter for the train crew? I didn't until I did a little research for this post. This tiny home's namesake inspired its exterior design. To peek inside the Caboose Guesthouse read on. Here's a view of The Caboose's main level. The 140 square foot space can sleep up to four people. The lower level has bunk beds and the upper level is a sleeping loft that features big windows and a cozy full-sized bed. To see another tiny house read on. The Skyline was built mostly out of reclaimed building materials — like the roof made from refrigerator panels and flooring made of old wood decking. To see peek inside The Skyline read on. The Skyline is a 160 square foot space that can sleep up to four people on the two queen-sized beds shown here. To see another guesthouse read on. The Tandem is a 160 square foot space that can also sleep up to four people. The small house has two queen beds. To peek inside The Tandem read on. Here's an interior view of The Tandem Guesthouse. The ladder leads to a sleeping loft. The first level is equipped with a queen-sized bed. Got a friendly dog? The Rosebud guesthouse allows small to midsized canines for an additional $25 pet fee. The tiny house is 100 square feet, and it fits one to two people plus man's best friend. To peek inside The Rosebud read on. The Rosebud guesthouse has a cozy sleeping loft in addition to a small . The home’s kitchen features a lovely pebble counter top.